Sugar Swings! Serve Some: Let's Play Ball - Filled Red, White & Blue Baseball Cupcakes! 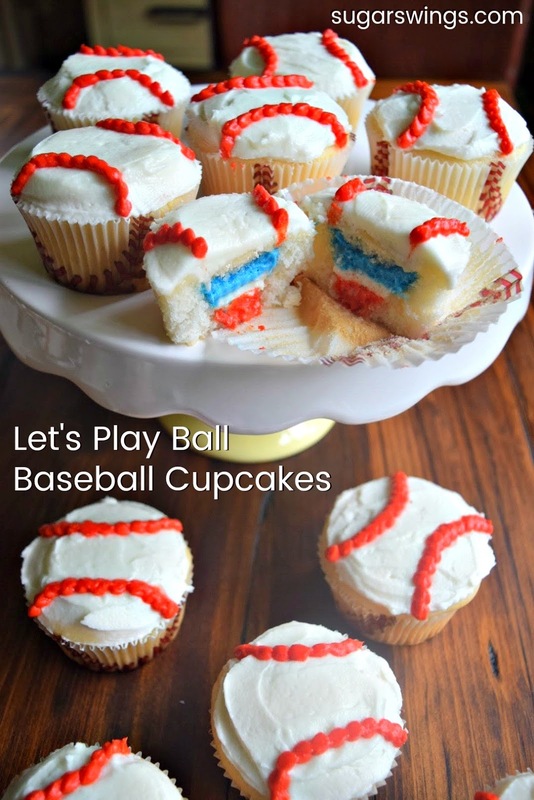 Let's Play Ball - Filled Red, White & Blue Baseball Cupcakes! Holy crow I haven't posted or baked in a LONG time! And you know what? That's OK. Totally OK! For the longest time I was putting pressure on myself to post at least weekly. For anyone that follows along, you know that I have 3 kiddos (10 year old twins and now a 13 year old - A TEENAGER holy cow!) and I work out of the house full time. This blog and baking/creating edible treats has always been an outlet for me. A way to relieve stress and do something that was just for me and unrelated to my day job. That said it was becoming more of another "to do" on my ever growing to do list. Just more of my type A personality showing its ridiculous head in the form of "Michelle you know you haven't posted anything really unique in forever so you must be losing the creativeness that people always compliment you on so you know get on with it even though you have kids that want to spend time with you and but they don't know about the ins and outs of the world yet which is a mess and really scary right now so you better model perfect human behavior and empathy but also you have a day job that actually pays you money and health benefits and you have a new boss so you better show what you can do at work and maybe start volunteering at a soup kitchen because you know your life is good and you should be giving back but your tired and over scheduled already but that's no excuse and you also need to spend some 1:1 quality time with you husband of 20+ years because you're both always tired and only complain or talk about schedules and kids and stuff keeps breaking down in the house oh and your daughter has a heart transplant and even though she's perfect and doing great is she going to have a normal life and will she have side effects from the plethora of meds she takes everyday and you spend $600 at Costco every 2 weeks but that's cool because at least you only have to physically buy toilet paper every 3 months" and then after thinking that or very similar everyday for a year your tell yourself to take a moment to breath (really BREATH) and to stop anything that doesn't have to get done and that's OK. SO.....I did! And guess what?? Life went on. I didn't make or bake anything ALL summer. No stress on myself for not posting or baking and it was nice and actually a relief. Now work is still stressful and the kids are back in school (also a stressful) but now I miss the baking/creating. So that means it must be time to go back! And I did tonite! 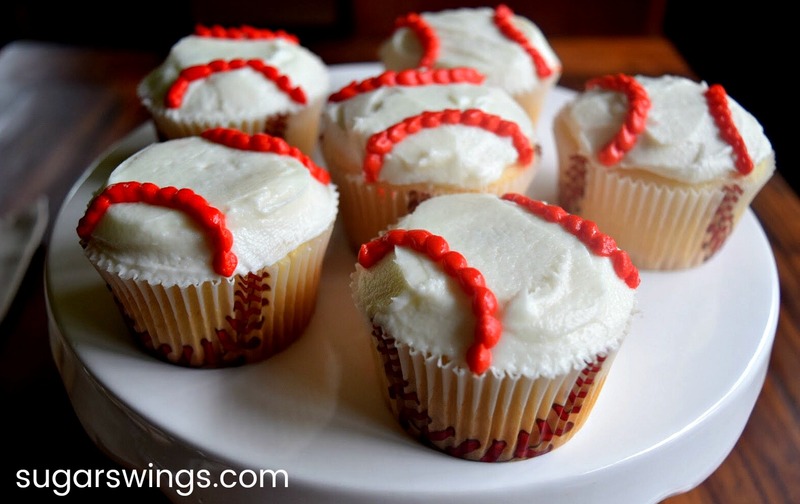 In all transparency these filled baseball cupcakes are from the June. (LOLZ) And that's OK! I made them for my kiddo's end of little league season in June. I knew I wanted to do baseball cupcakes but with a little something extra inside. Take out the center of your fav baked cupcake and then fill with buttercream. 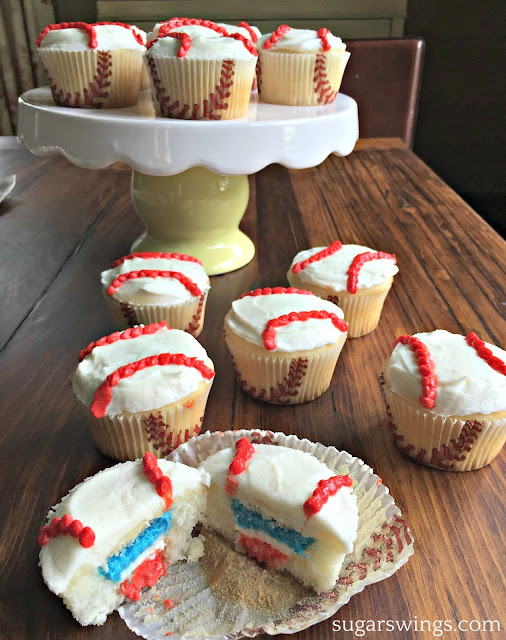 I used red, white, and blue tinted vanilla buttercream to layer inside the homemade vanilla cupcakes. 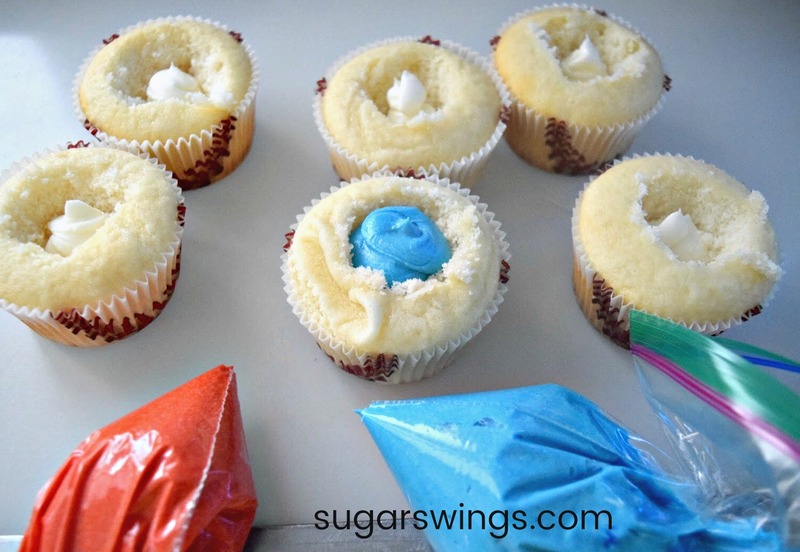 Add first color with a squirt of buttercream and follow with the other colors layered on top of each other. Totally optional as the baseball stitches work just as well on their own. 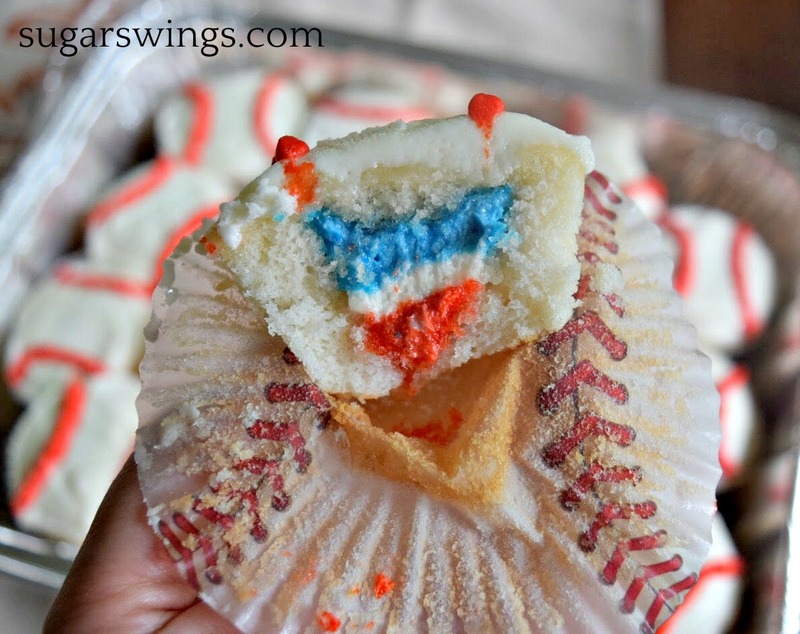 But the layered filling is very fun for 4th of July or for your favorite baseball fan. 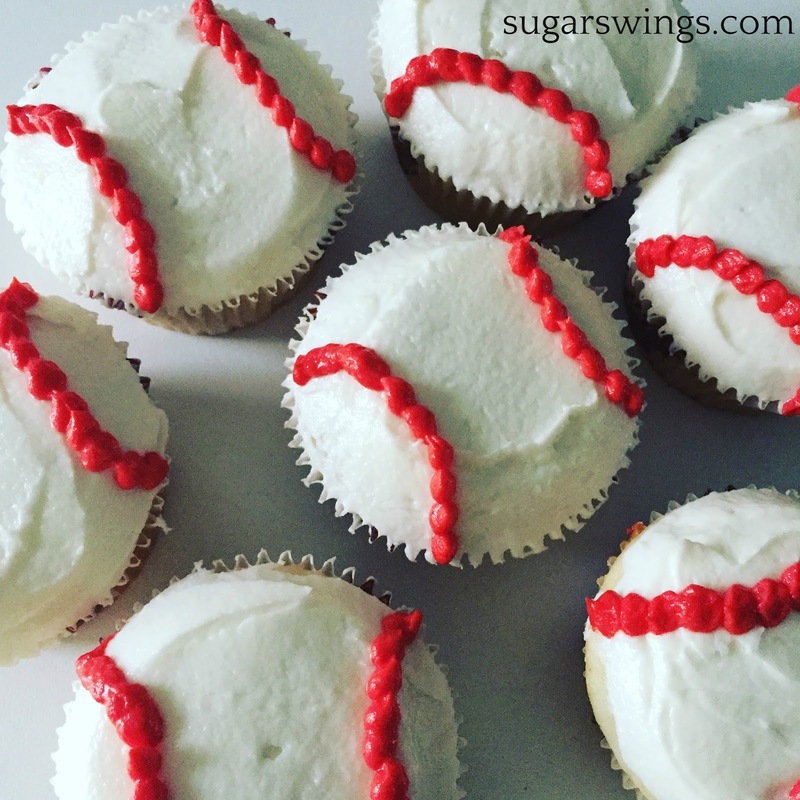 We're huge Yankee fans here and they're doing pretty well this season so we're hoping for October baseball this year! Might need to make these fun filled cupcakes again! So what did you do this summer?!! Are you ready for all that is pumpkin spice? I am!